You will pay $20 per 10 week term to attend classes. Payment is due the first week of class. All registrations are done through the Woolley Center, regardless of where you intend to take classes. Contact the ABS main office at 541-440-4603 to register. What exactly is the GED® test? The GED® test is actually 4 different tests: Math, Science, Social Studies, and Language Arts. Each test is $38. Once you pass all four tests, then you’ve passed “the GED test.” Visit ged.com for more information about the test. How long does it take to get my GED®? Adult Basic Education/GED® Classes help you reach that 12th grade, high school graduation level, to prepare your next step; whether it be ready for college or ready for the workforce. Length of time to complete depends on your skill set you already have when entering the program. An assessment test is done prior to starting classes to determine appropriate enrollment level. What if I already have a high school diploma? Can I still take ABS classes? Yes! Adult Basic Education Classes are there to get you up to that 12th grade, college and career readiness level. 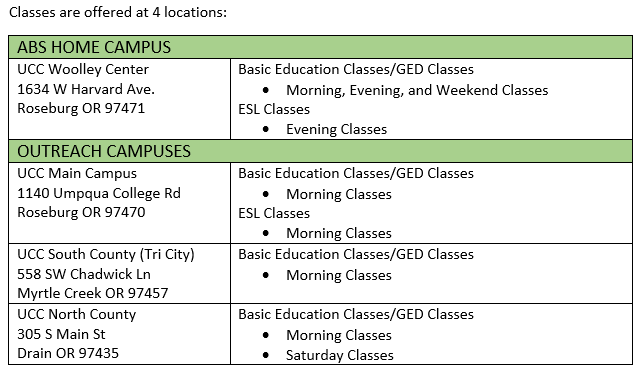 If you’ve already obtained a high school diploma or GED®, but would like to brush up on your skills before enrolling in college or making an employment change, Basic Education Classes would be the place to start to better prepare your success for the next step!